More than 1.4 million people are treated for bicycle-related injuries each year. As orthopaedic surgeons, we treat many of these injuries. The most common cycling accidents involve bruises and minor cuts, followed by fractures, then lacerations and strains and sprains. When it comes to mountain biking, the most common way to sustain an injury is by going over the handlebars. Obviously, this occurs when there is too much speed and too much momentum involved. 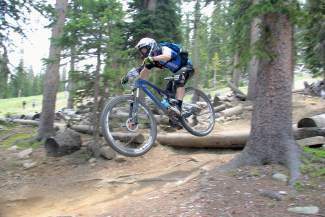 Fatigue is also often a factor in traumatic mountain bike injuries. We are all familiar with the phenomenon of the “weekend warrior,” someone who gets more easily fatigued versus the well-conditioned athlete. It’s important to gradually increase your time with any new sport to help your body adjust and adapt to the new demands you are placing on it. Injuries here often come in two flavors, one being the seasoned rider that goes down hard after a quick loss of control, the other being more of a novice that only bikes a couple of times a year when they visit the mountains. If a feature or a section on a trail seems intimidating then simply walk it rather than risk a substantial injury. The top three mountain bike injuries caused by going over the bars are wrist fractures, clavicle fracture (or broken collarbone), and an AC joint separation in the shoulder. Anyone who has been involved in a major bike accident will attest to the fact that speed is a very important factor in severity of injury. There is nothing soft and fuzzy about a mature spruce tree. Many people ask us how to determine whether their injury is bad enough to see a doctor. With a wrist injury, a bad sprain that lasts more than one month and does not get better needs to get checked out. As with any injury, if there is a lot of bruising and swelling, consider an x-ray to make sure there is no fracture. As you would expect, fractures and soft tissue injuries are treated very differently. Clavicle fractures are extremely common. Symptoms are shoulder pain, and difficulty moving your arm. Swelling and bruising around the broken bone can occur. The fracture can often be felt through the skin after the swelling goes down. Most patients know it right away if they fracture their clavicle. Patients with an AC joint separation or AC joint sprain will feel pain at the end of the collar bone. The pain may be felt throughout the shoulder initially but more localized later on. Intense pain may be felt when trying move the arm above the shoulder and there may be an obvious lump at the joint location with more severe injuries. Most AC joint injuries can be treated conservatively without surgery. In general, mountain biking is a relatively safe sport. Staying reasonably fit and maintaining control of your bike and your speed will drastically help reduce your risk for serious injury. Dr. Terrell Joseph is an orthopaedic surgeon with Vail-Summit Orthopaedics specializing in Hand and Upper Extremity, and Knee Surgery.